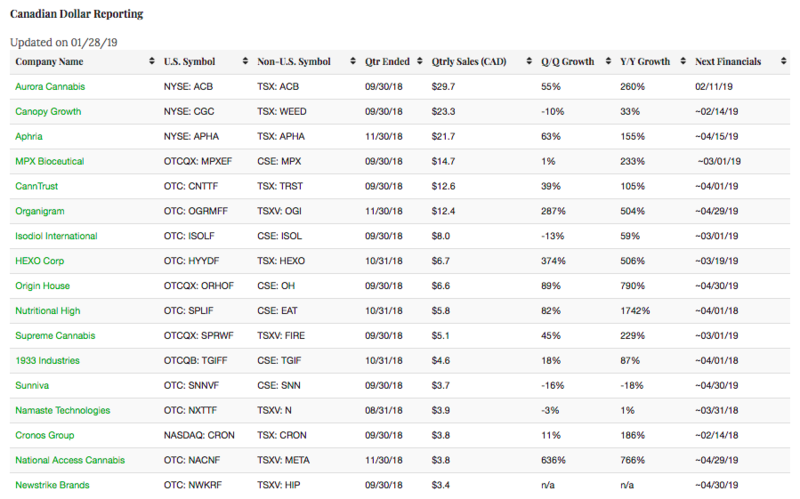 The Public Cannabis Company Revenue Tracker, managed by New Cannabis Ventures, ranks the top revenue producing cannabis stocks that generate industry sales of more than US$2.5 million per quarter. 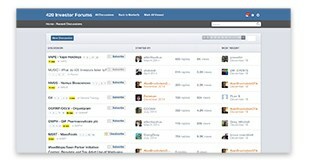 This data-driven, fact-based tracker will continually update based on new filings so that readers can stay up to date. Companies must file with the SEC or SEDAR to be considered for inclusion. 41 companies currently qualify for inclusion, with 24 filing in U.S dollars and 17 in the Canadian currency. Since our last report near the end of December, we have added two companies reporting in Canadian dollars, Organigram (TSXV: OGI) (OTC: OGRMF), which rejoined the list, and National Access Cannabis (TSXV: META) (OTC: NACNF), an operator of retail stores and medical clinics in Canada. The only changes since we last reported the U.S. dollar reporting companies were for KushCo Holdings (OTC: KSHB), which moved to the second spot after reporting FY19-Q1 sales that grew 186% from the prior year to $25.3 million, exceeding analyst forecasts of $18.8 million, and for Cannex Capital (CSE: CNNX) (OTC: CNXXF), which saw a 10% sequential decline in revenue. We expect no reports during February for these companies. Of the companies that report in Canadian dollars, Aphria (TSX: APHA) (NYSE: APHA) and Organigram (TSXV: OGI) (OTC: OGRMF) both provided updated financials. Aphria, which reported FY19-Q2 sales in mid-January, saw growth of 155%, though the $C21.7 million in revenue it generated fell fall short of the C$40.1 expected by analysts, according to Sentieo. Organigram FY19-Q1 sales of C$12.4 million represented growth of 287% and were greater than the sales generated in entire prior fiscal year. National Access Cannabis sales rose 766% from the prior year as it recognized sales in its Canadian cannabis retail operations for the first time. Of the companies that report in Canadian dollars, we expect four will issue financial reports in February, including Aurora Cannabis (TSX: ACB) (OTC: ACB), Canopy Growth (TSX: WEED) (OTC: CGC), Isodiol International (CSE: ISOL) (OTCL ISOLF) and Supreme Cannabis (TSX: FIRE) (OTC: SPRWF). According to Sentieo, Aurora Cannabis, which pre-announced FY19-Q2 revenue of C$50-55 million, is expected to report revenue of C$54.6 million, which would represent growth of 366% from a year ago as the company recognizes sales into the adult-use market. Aurora Cannabis reports on February 11th and will be hosting a conference call. Analysts expect Canopy Growth, which reports on February 14th and hosts a call on the 15th, to report FY19-Q3 revenue of C$85 million, which would represent annual growth of 292% and would restore it to leader of the sector by this metric. Analysts project that Supreme Cannabis will report FY19-Q2 sales of C$7.9, which would represent annual growth of 372%. Visit the Public Cannabis Company Revenue Tracker to track and explore the complete list of qualifying companies. 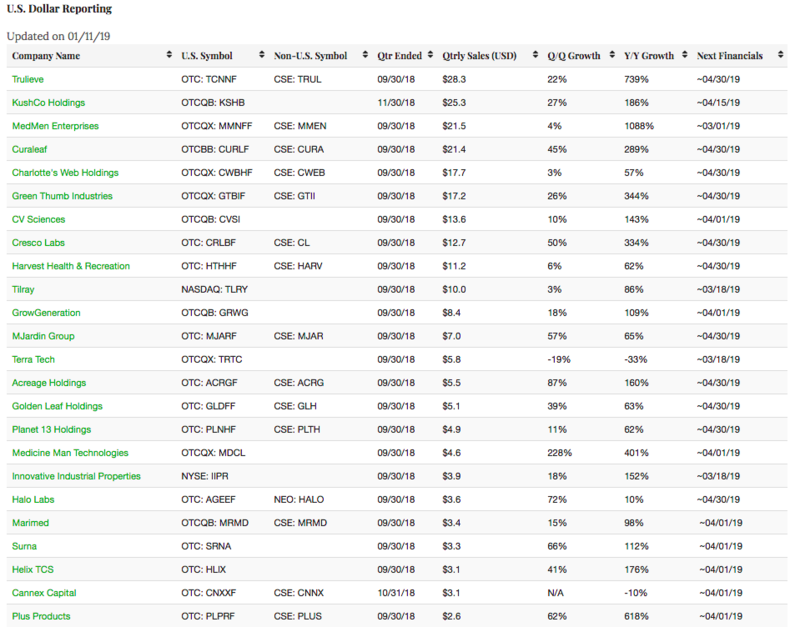 For our readers who are interested in staying on top of scheduled earnings calls in the sector, we have recently introduced the Cannabis Investor Earnings Conference Call Calendar.